We tend to caricature those we dislike. We usually do it with words, either dismissive or insulting. Sometimes we do it with images. I wrote an essay once entitled “Demonizing Our Enemies,” and in this world of constant turmoil it includes a message we cannot afford to forget. If you’re interested in reading it, it’s on page fifty-four of the first issue of Curtana: Sword of Mercy, and you can read (or download) it for free here. Sometimes, however, what appears on the surface to be an insult . . . may simply be a reflection of accuracy. That, I think, is the case in the coin pictured above. 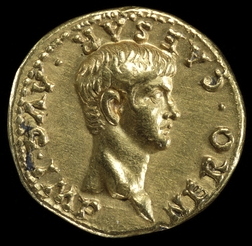 It displays a portrait of the Emperor Nero, in all of his porcine grandeur. It is, in a single word, grotesque. Consider this image, of the emperor in his youth. It’s rather disgusting to see what he had become. But the fruits of unrelenting debauchery and murder do take a toll. As a bit of a numismatist, I was curious as to how it came to be. 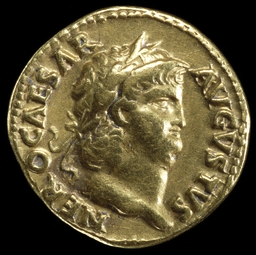 My first impression upon seeing the bizarre likeness of the imperator was that it must be a “barbarous” imitation of a Roman coin. Such counterfeits became fairly common in the fourth century, and they are usually identified by terribly garbled legends (inscriptions). After doing enough research to determine this was a genuine imperial issue, I wondered if the celator (die-carver) might have been put to death for his presumption. No evidence of that, though it may have happened. I have to assume that Nero was so self-consumed that he was oblivious to the way the corpulent image must have invited silent ridicule. He was, after all, despised by virtually everyone for his countless excesses. So, ultimately, the doomed emperor unintentionally played the proverbial joke upon himself. By allowing an accurate portrayal of the imperial profile, he preserved for all time a true testimony to himself. He may have falsely blamed the Christians for Rome’s terrible fire, but he had no one other than himself to indict for his metallic legacy. A University is a society for the pursuit of learning. . . . At first sight this seems to be an odd thing to do during a great war. What is the use of beginning a task which we have so little chance of finishing. . . Is it not like fiddling while Rome burns? Now it seems to me that we shall not be able to answer these questions until we have put them by the side of certain other questions which every Christian ought to have asked himself in peace-time. I spoke just now of fiddling while Rome burns. But to a Christian the true tragedy of Nero must be not that he fiddled while the city was on fire but that he fiddled on the brink of hell. And—lest any of us smugly nod in agreement that such an evil man most assuredly deserved his searing fate—here is another passage from Lewis that offers a sobering truth. In the long run the answer to all those who object to the doctrine of hell, is itself a question: “What are you asking God to do?” To wipe out their past sins and, at all costs, to give them a fresh start, smoothing every difficulty and offering every miraculous help? But He has done so, on Calvary. To forgive them? They will not be forgiven [editor: they will not accept God’s forgiveness]. To leave them alone? Alas, I am afraid that is what He does. One caution, and I have done. In order to rouse modern minds to an understanding of the issues, I ventured to introduce in this chapter a picture of the sort of bad man whom we most easily perceive to be truly bad. But when the picture has done that work, the sooner it is forgotten the better. In all discussions of Hell we should keep steadily before our eyes the possible damnation, not of our enemies nor our friends (since both these disturb the reason) but of ourselves. This chapter is not about your wife or son, nor about Nero or Judas Iscariot; it is about you and me. (The Problem of Pain). Using the coins’ images is a brilliant springboard into the post. That last line of Lewis has a great deal of impact. Lewis still makes us think by reaching out through you, and God through both of you, Thanks! When Jesus was asked to judge to woman caught in adultery, he made the same point. Look at yourself, you think she deserves death and hell what about you. They all walked away, then thank God Jesus did not condemn her either but enjoined her to go and sin no more. Wow. I have not yet read The Problem of Pain, nor had I ever encountered that quote.